I am a classically trained Cellist who plays most genres of music: Classical, Jazz, Blues, Hip-Hop, Rock, Alternative, Heavy Rock, Country, R&B Soul, Gospel, Reggae, Fusion & Cultural sounds. I play customized songs as requested on the electric & the acoustic cello. I also play with bands, orchestras & duets/trios. I have performed at Embassies, Hotels, Museums, the White House, Theaters, Mansions, Coffee Houses, Restaurants. I play for Weddings, Receptions, Cocktail Hours, Anniversaries, Funerals, Festivals, Celebrations, Birthdays, Engagement Proposals, Church Events, Music Therapy, Office Building Openings, Holiday Parties, Fundraisers & Just Because. I would love to play at your events. 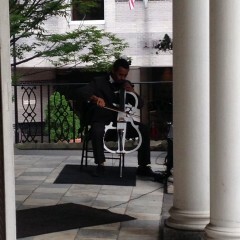 Benjamin Gates is a wonderful cellist and did a great job at my daughters wedding. The only problem was there was some confusion about the processional song and he played the wrong one.....same title, different artist. Fortunately, my daughter was ok with it and no one was the wiser. I heard lots of positive comments about his playing. I would recommend him highly! Benjamin is a fantastic musician. He is warm and smooth. He and his cello fill the room with light. He is amazingly gifted, professional, and personable. Ask him about his affinity for mentoring and serving the community! Ms. Brenda Moore, it has been great working with you and I thank you so much for hiring me. You and your clients are awesome. My husband and I booked Benjamin for our anniversary celebration on October 10th. He was absolutely wonderful. He was prompt and had already begin to play as we arrived. Played the song we chose and an additional song as a bonus! He's a master at his craft. Benjamin's warmth added to the already heartwarming occasion. We'll be using Benjamin for other occasions soon. Amazing talent! Jesse and Lorenzo. We really truly enjoyed playing for you for your first year anniversary. We were honored; hope to keep in touch and we hope that we can play on many more of your special occasions. Again, thank you so much for hiring us. Benjamin and Kay. I cannot recommend Benjamin Gates highly enough to truly represent his talent, professionalism and wonderful manner. Benjamin was able to accommodate our booking at very short notice and even found the time to learn a new song for the bride's entrance at the wedding. Benjamin is an extremely talented, contentious and genuine young man. We were all just in awe of the atmosphere he created and felt so lucky to have had him at our family celebration. You now have fans in Washington, New York, Vancouver and Dublin! Thank you so much Benjamin! I can offer you someone with a great talent, and will ensure that your musical services are met. I am very professional and I love to work directly with my clients to ensure whatever the event is, is a great event, and that the client(s) would request for me to play again, and/or refer me to their family, friends and coworkers. I ensure that I dress for the event. I am very well verse and can be very articulate when asked questions. I am big on customer service and I go out of my way to ensure that customer service is "A+". Overall, I fit the bill for whatever event I am hired to play. Benjamin Gates was born and raised in the Washington Metropolitan Area. He is currently a self-employed Cellist. Benjamin, at a very young age had such a love for music that he made homemade instruments and played them making rhythmic sounds. His mom saw his talent and started him in music classes. 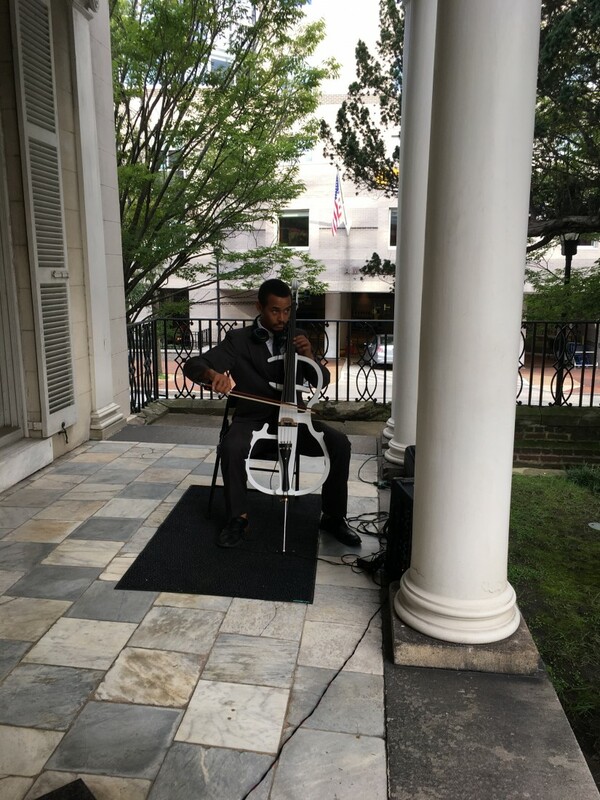 Benjamin began playing the acoustic cello as a young child and continued to train in different orchestral programs in elementary, middle, high school and college. 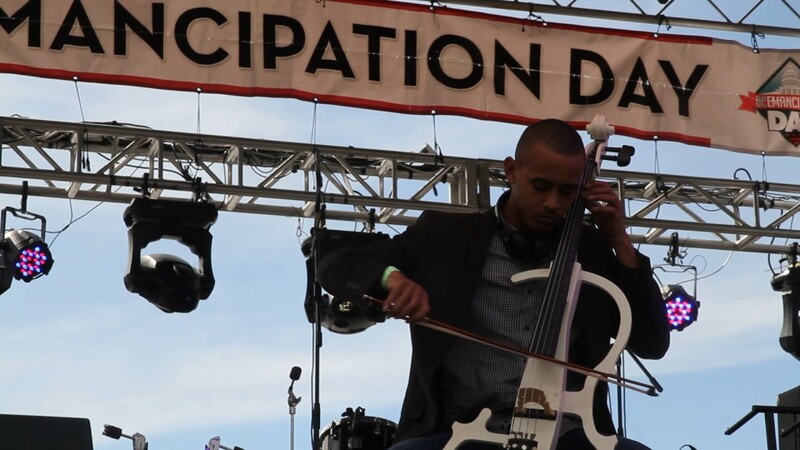 Upon returning from College, Benjamin began working with and playing the electric cello. 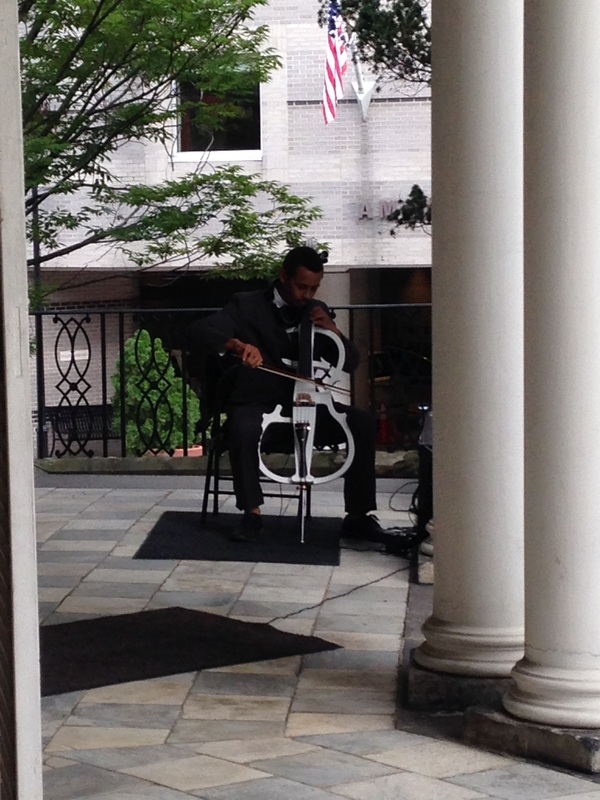 As a result, Benjamin plays both the Acoustic and the Electric Cello professionally. Benjamin Gates is the Founder and CEO of Asteroid Titanium Musical Productions and Entertainment, LLC where he provides live musical performances, audio engineering, creates, produces through composing and arranging his own and other musicians' music. Benjamin is classically trained and plays most genres which include: Classical, Jazz, Blues, Hip-Hop, Rock, Alternative, Heavy Rock, Country, R&B Soul, Gospel, Reggae, Fusion and Cultural sounds. Benjamin will play customized songs as requested on the electric and the acoustic cello. Benjamin also plays with bands, orchestras and duets/trios. As a Soloist, Benjamin has performed at venues in the Washington, DC area, Richmond and New York. Some venues and events include the National Museum of African American History and Cultural One Year Anniversary Gala for the VIP Reception; the International Gala featuring the Queen of Sweden and other international dignitaries (on two occasions); a fundraising event for the new African American Museum with Oprah Winfrey and Congressman John Lewis in attendance; the Arena Stage where Omari Hardwick performed and awards were presented to Cathy Hughes and Jesse Jackson, the Prince Georges National African American Museum for Channel 4 (NBC) Black History Program, Mayor Bowser’s Emancipation Breakfast and the Emancipation Concert and other politicians. Additionally, Benjamin played for the original Tuskegee Airman, and the 45th Anniversary for the Black Ski, Inc. He acted as a Civil War Era Cellist on the TV show, Mercy Street on PBS. Benjamin has played for several galas in the Washington, DC area and other events/venues including events hosted by Financial Institutions at the National Museum of African American History and Culture; the National Gallery of Art, the Atlas Theater of Performing Arts, the Anderson House, the Tudor House, Embassies, Hotels, Hospitals and Medical Facilities, Museums, the White House, Theaters, Mansions, Coffee Houses, Restaurants and smaller venues in the Washington, DC area. Additionally, as a Soloist, he has performed on Television Stations in Washington, DC: PBS-WHUT, "Artico"; WUSA-Channel 9, “Great Day Washington”; Fox-Channel 5, “Beyond the Lens”; WJLA/ABC-Channels 7 and 8, “Inspire”; NBC-Channel 4, “Black History Month: Faith”; the Grammy Town Hall at the Office of Cable Television, Film, Music and Entertainment and on the DC Channel, "The Sound"; and also on CNN and GHL Live. B’nai Mitzvah, B’not Mitzvah, Birthday Celebrations, Charity and Community Events, Church Services and Events, Cocktail Parties, Company Events, Conferences, Engagement Celebrations/Proposals, Family Reunions, Festivals, Fundraisers, Funerals, Graduations Celebrations, Holiday Celebrations, Launch Parties, Marriage Proposals, Music Therapy, Office and Company Parties, Restaurant Gatherings, Salon Appreciations to their customers, Studio Sessions, Tea Parties/Luncheons, VIP Receptions, Small House Parties, Just Because and Other events that you would enjoy live music. Benjamin started an annual drive (Covering from Head to Toe) to help keep people-in-need (homeless) warm during the winter months. This includes purchasing new hats, scarves, gloves and socks from family, friends and supporters, packaging as 4 piece sets into gift bags; and walking the streets of Washington, DC distributing the gift bags, as well as distributing them to homeless shelters. He plays at several metro stations in the Washington area as community outreach for people to be actively engage in music. Because of his dedication to play music to everyone and being actively involved in the Community, he has been called, “The Musician for the People." An electrical outlet, power cord strip and a straight chair without arms. I bring my own amplifier, speakers system as needed, and I come to the venue well in advance to do an a proper sound check prior to the performance. Weeping of the Stone by Benjamin Gates (original) and whatever songs the client requests 2-3weeks prior to the performance.